It all started for me on Thurs 7th when I booked into the Venture Hotel in Deptford, although just outside of the constituency, a lot of people I met lived within the voting area, apart from that it was also a public house ‘The Royal Standard’ which was very popular. 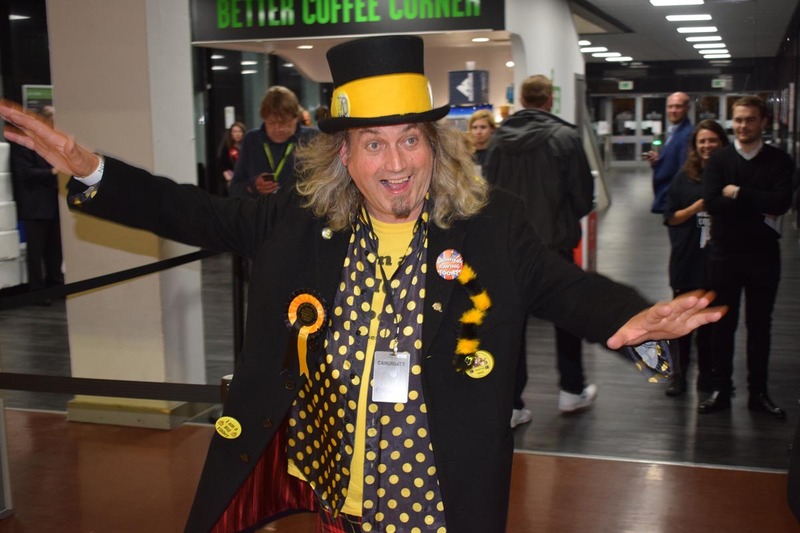 Canvassing back and forth on the bus, it was surprising who you would want to talk to you, once you put a Loony Badge on Well looked after by Ade and Jazz, nice place, nice people, nice company. Next four days was spent with my Cousin Martin Horton, and his wife Jackie in Brockley. Once again not quite within the constituency, but near enough to be able to use as a local address for the forthcoming election. Thank you Martin. 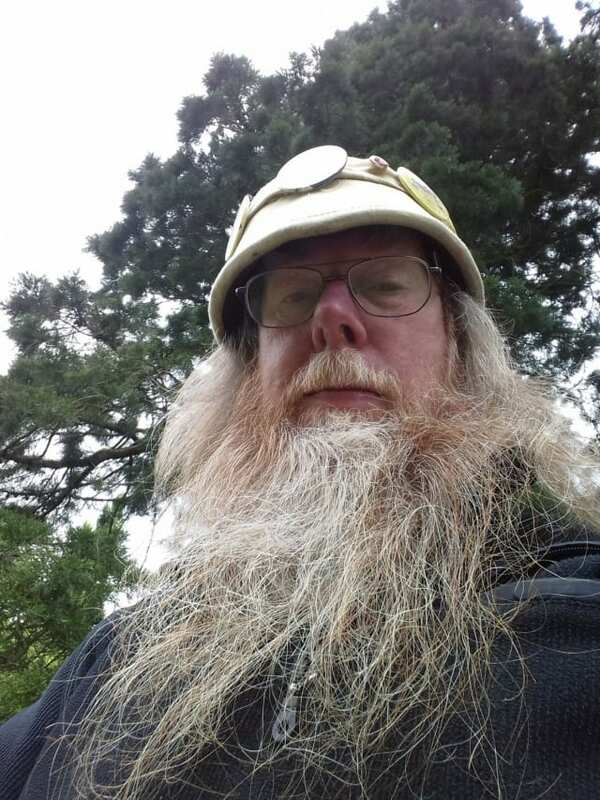 On the Tues 12th I attended a Hustings meeting at the local Salvation Army Hall, quite an experience, I got through my speech with flying colours, but as soon as Ukip candidate got up the racist accusations started, the police stopped the meeting just before the end, afraid of repercussions they said. What would have been more in line would have been to move the protesters on, and let a peaceful ‘Hustings Meeting’ continue. 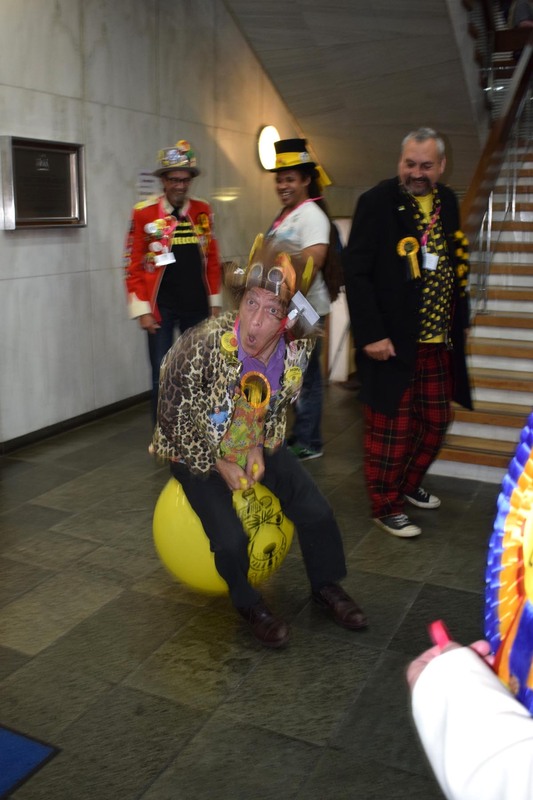 So eight days in all, trying to be our very first member of Parliament, all to no avail, I’m sorry, but at least we did try. 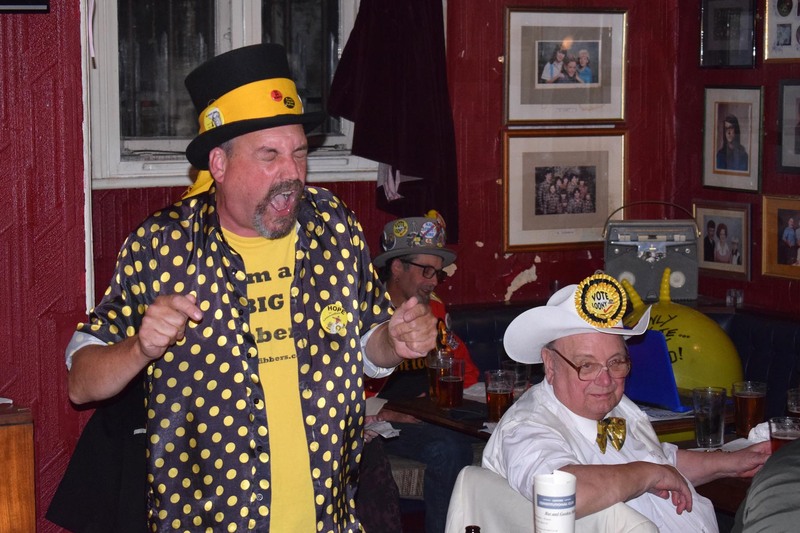 On the count night we all met up in the Catford Constitutional Club. The Flying Brick, Baron Badger, Lady Helen Back, Chinners, Mr R U Seerius and Sir Knigel Knapp. The same place where Chinners and Knigel got all the nomination names from. We were joined by Sean Finch and his Libertarian Party, although we did i nvite every party along to join us. Sir Knigel gave a solo performance and preview of songs on his latest yet to be released album. A good fun evening all in all, and so on to the count. We didn’t bother getting there in any rush, as we were informed that it would be 3pm before the result would be announced. We got there 12.45 to join in, and it was virtually all over apart from the official result. We made our usual noisy but very complex entry, much to the applause and smiles of all who were watching. We came 9th out of 14 candidates with 93 votes, low turnout 33.35%. You only needed 1,099 votes to retain your deposit. Only 3 party’s did that. When you consider that one of our voting catch phrases is ‘The only wasted vote is the one that’s not used’, just consider what the outcome could have been if the 44,084 people who didn’t bother to vote, actually voted for us ! ! ! ! It will happen one day, when people realise that we are the only party that’s on every body’s side no matter what your political persuasion may be ! Here’s to the next one, whenever. If not before, I shall see you all at the Conference in Belper Derbyshire, Sept 27-28-29th. See – loonyparty.com – for more details. We are pleased to announce that our deposit has been paid and nomination papers officially accepted, yes we are up and running. 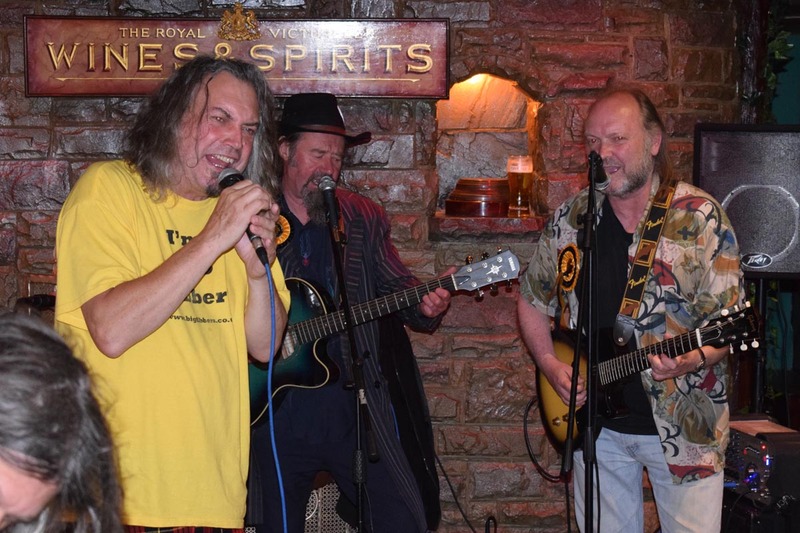 Our candidate is our Illustrious Leader, Howling ‘Laud’ Hope. After a bit of a false start with our nominated agent Trevor Allman, he had a bit of trouble collecting the 10 names for the nomination paper. Well done Trevor for trying, but maybe you shouldn’t have tried to do it, on a rainy day. Nevertheless on Weds 16th May we sent in reinforcements in the shape of ‘Chinners’ the Chin-up Boy, minister for Spinning and Bouncing, and ‘Knigel Knapp’, The Knight of the Unknown. Within an hour and a half, the mission was completed, thanks from us all for this sterling effort. 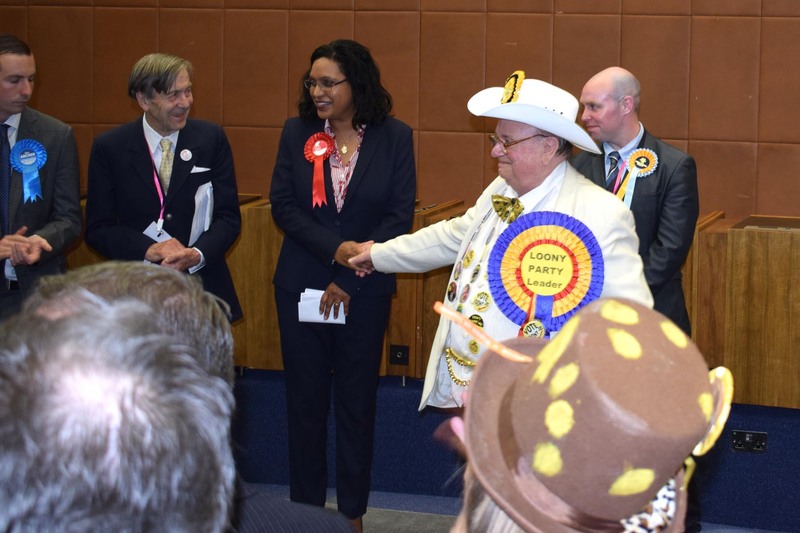 All the electors names being obtained from ‘The Catford Con Club’ if that’s not sterling I don’t know what is. Well done, pat on the back (more like a pint of beer) to our two staunch stalwart party members. This is Looniness working together! On Friday 18th, Chinners and myself spent time in the Boro of Lewisham depositing said monies and papers. The Election Officer, Jamie Baker seemed very pleased that we were standing, (it’s not a real election without you) was the attitude. Very amiable and helpful person, thank you Jamie. Cant wait to get this show on the road now, not too sure where the count will be yet, but will be informed. 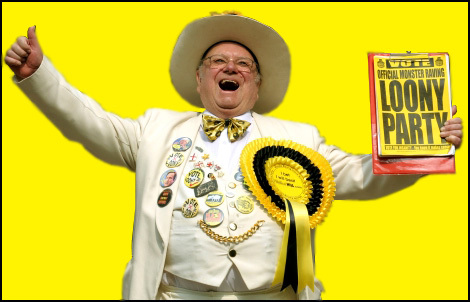 Our Illustrious and stalwart party leader Alan ‘Howling Laud’ Hope is the obvious choice to be Lewisham East’s next MP. 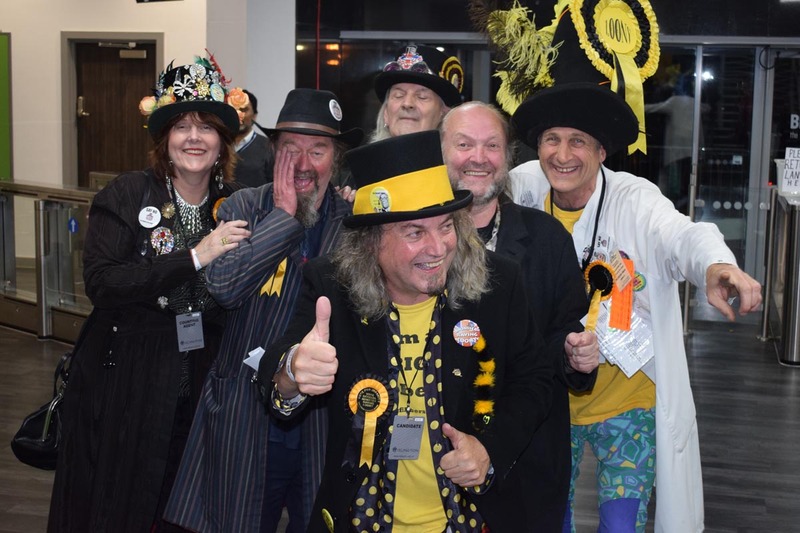 Howling is a familiar face on the political scene having previously fought 21 Parliamentary seats against Teresa May, David Cameron, Boris Johnson and many others. 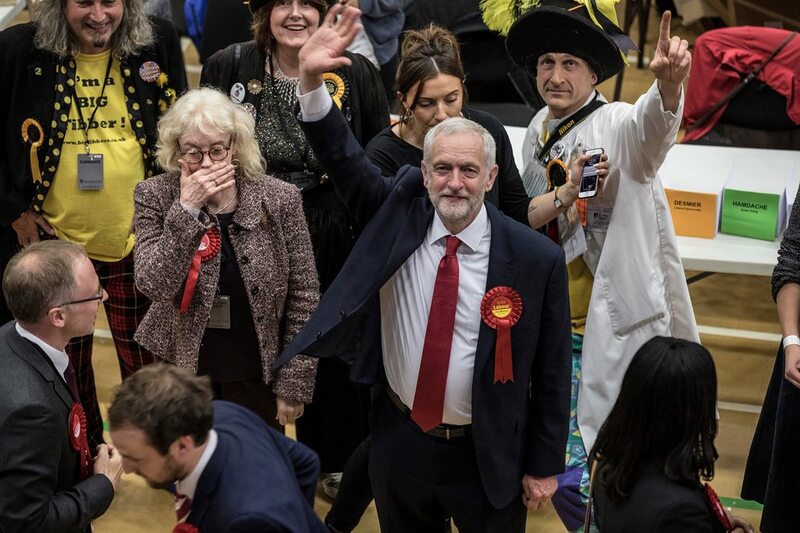 He is feeling jubilant as he has just been returned to serve on his local ‘Fleet Town Council’ Hampshire for another four years. This is his third win for this seat. 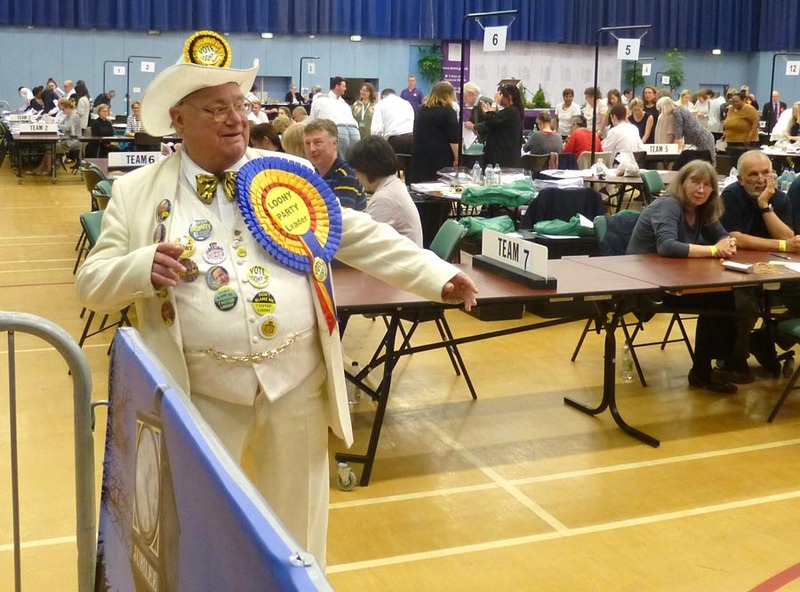 He has previously been the Town Mayor, Chairman of the Council, Lord of the Borough for Ashburton, Devon 1998 – 2000, and Ashburton Town Councillor for 13 years. So he has a lot to offer the people of Lewisham East. All these elections have been achieved on a ‘Loony Party’ ticket. 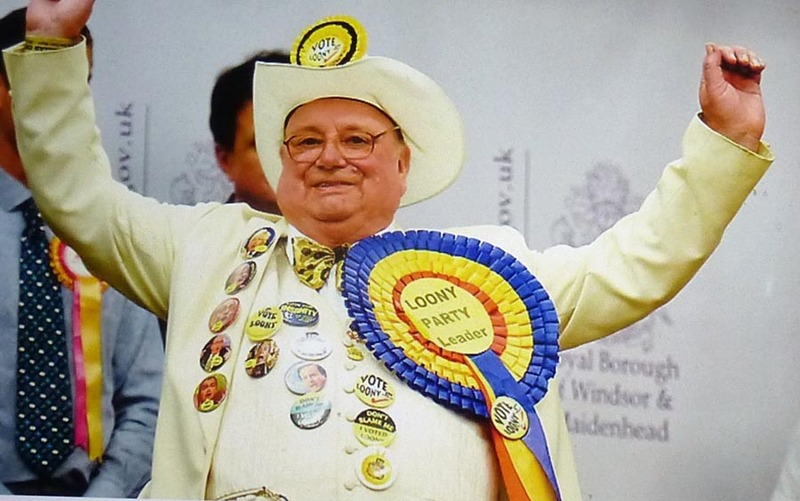 If you don’t usually vote, then vote unusually, vote Loony. Remember the only wasted vote is one that’s not used. Heidi Alexander, a Labour MP, stood down yesterday to become the London deputy Mayor for Transport. 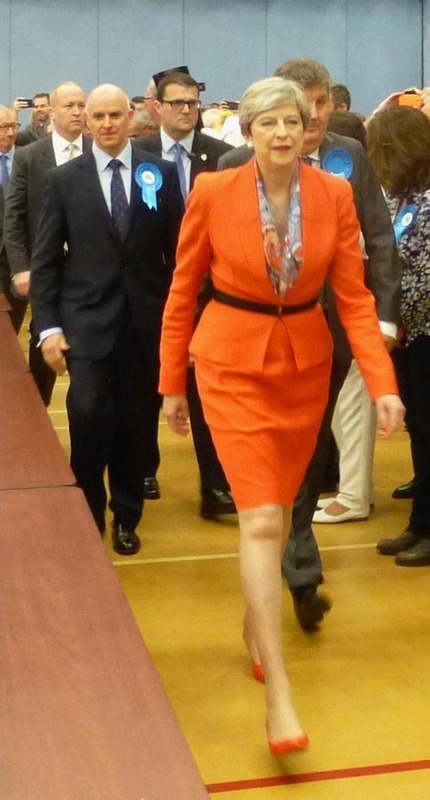 She is vacating her Lewisham East seat. 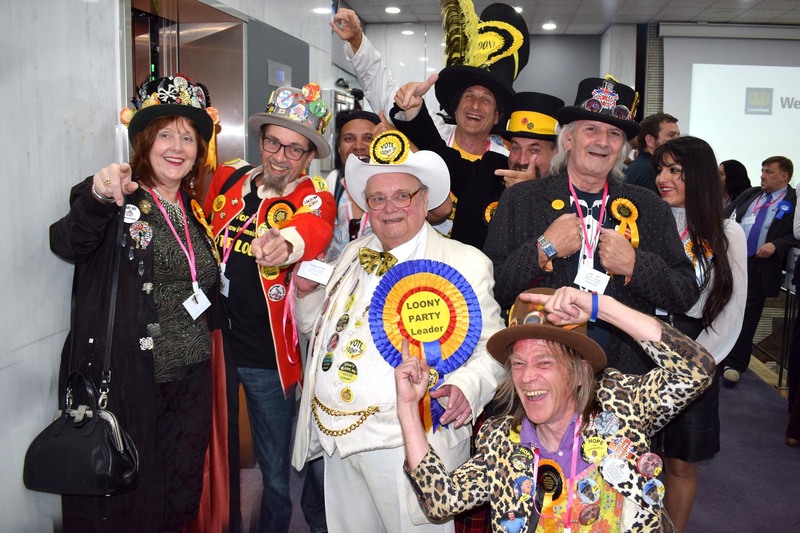 The ‘Official Monster Raving Loony Party’ will be contesting this seat, in the shape of their well seasoned parliamentary candidate, party leader, Howling ‘Laud’ Hope. His running mate, agent, will be Trevor Allman, more commonly known as Lord Halfperson. 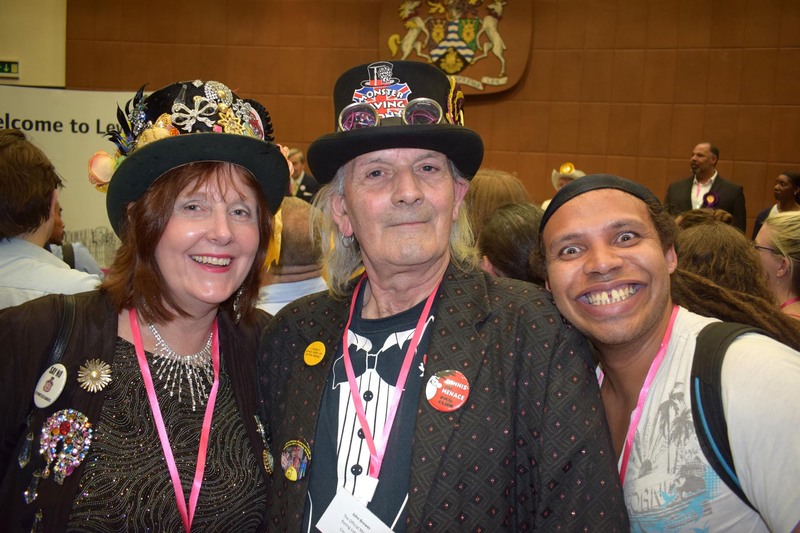 He very recently stood in the recent local council elections in Blackheath Greenwich, polling 106 votes. 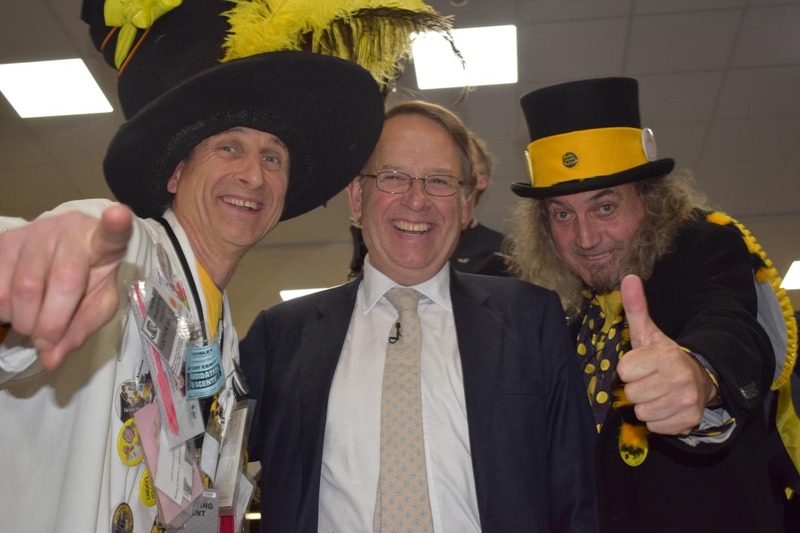 Howling ‘Laud’ Hope however was returned to his local Town Council in Fleet, Hampshire, with an overwhelming amount of unopposed votes, for the third time running. Nobody knows when this will happen yet, but keep an eye on www.loonyparty.com for regular updates. We are all looking forward to it with great anticipation, and Looniversal Sensibilism! Remember – The only wasted vote is one that’s not used! So Theresa May sprung a General Election on us and there we all were thinking that it wouldn’t be until 2020, so much for fixed parliaments! Well it meant that I wasn’t able to stand cus I hadn’t got any money saved for my deposit, I thought I had 3 more years! Ah well . . . 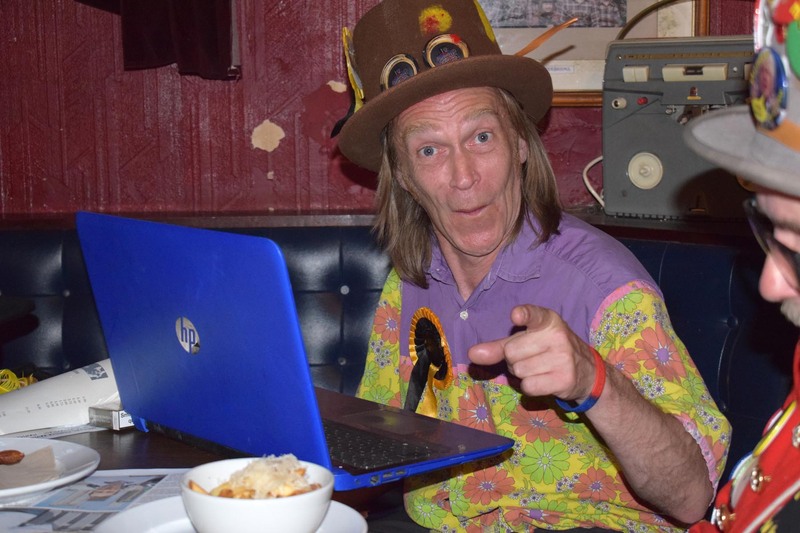 So I started campaigning on Facebook, managed to get my nomination forms signed – one afternoon in a pub I know – and came up with a few ideas for my personal manifesto. And that’s all I did. Except for a very brief, pre-recorded, interview which went out on Jeremy Vine’s Radio 2 show. 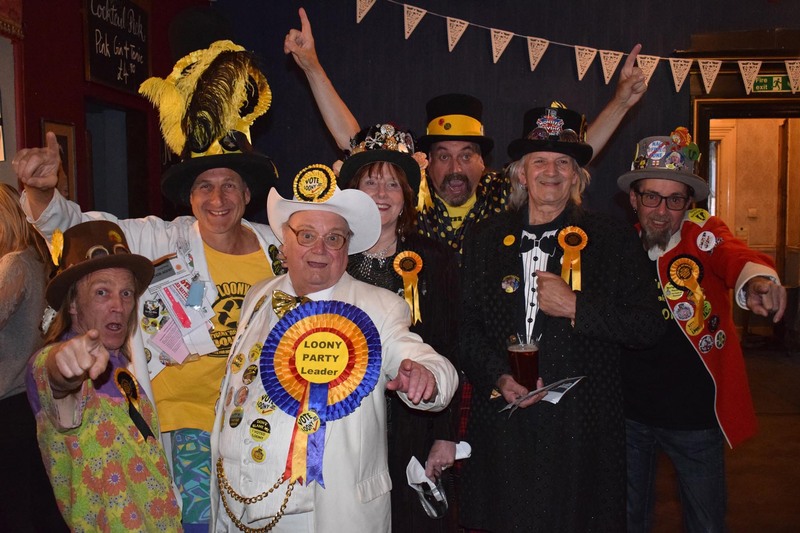 I didn’t spend any time pounding the streets in loony gear handing out flyers and I didn’t talk to as many people as I could in as many pubs as I could visit, I didn’t do any of things I’ve done when I’ve stood in previous elections. I did find time to organise a Victory Party though. And by June 8th I’d even printed a few copies of my Manifesto. 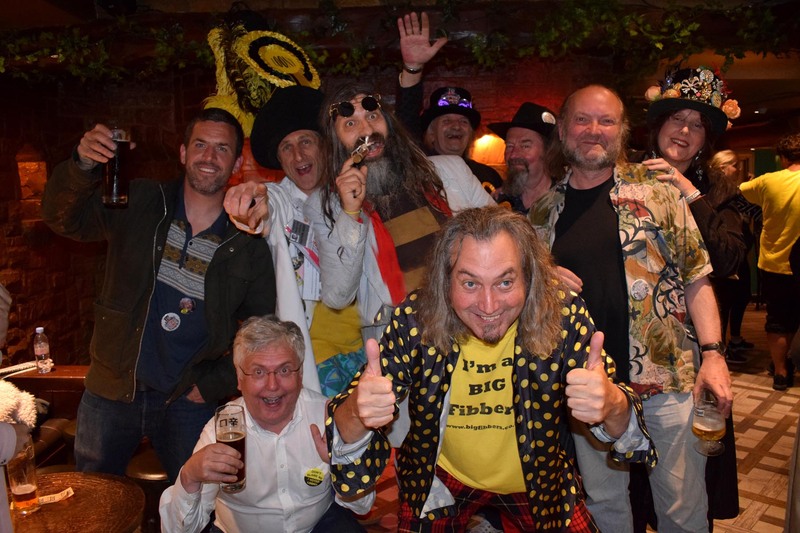 The response on Facebook was fantastic and my band The Big Faux Fibbers packed out The Liquor Works on Holloway Rd and we all had a great time. We even had the ‘Comedy Terrorist’ Aaron Barschak turn up in support. We were expecting security to be tight at The Sobell Sports Center but it didn’t take long to get in. And then the long wait. We wandered around, chatted to everyone there. Nick the Brick had decided I needed some training and when we heard that J.C. was on his way he insisted that I stood by the entrance to greet him – which I did. As Jeremy walked into the hall he was surrounded by mass of photographers, a real media scrum! Half an hour later the results were announced and there I was on stage right behind Jeremy Corbyn as he was giving his winners speech. beamed all over the world via Facebook – see https://www.facebook.com/nigel.knapp.52, and I even have a photo with speech bubble in Private Eye! Yes it was all very good – would I do it again? Well maybe – but certainly not in the next 6 months. Which is maybe looking likely ARGH! 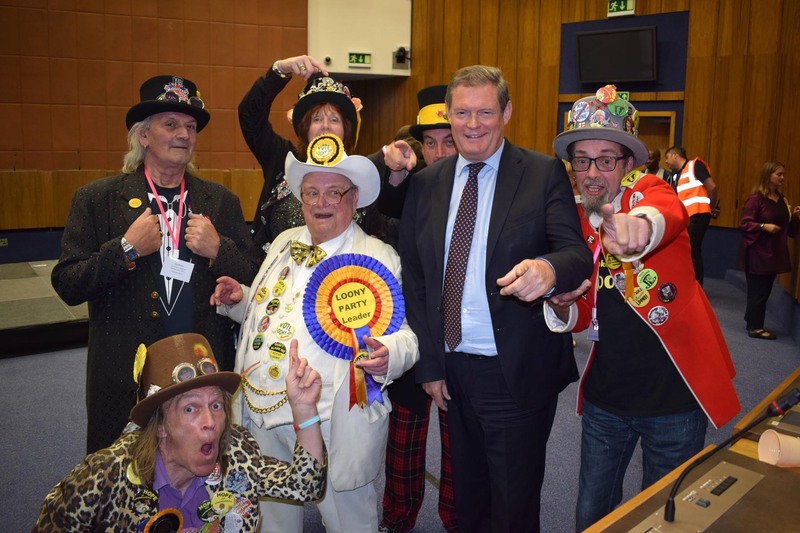 Although we are ‘Loonies’ we often appear to be the sensible party. 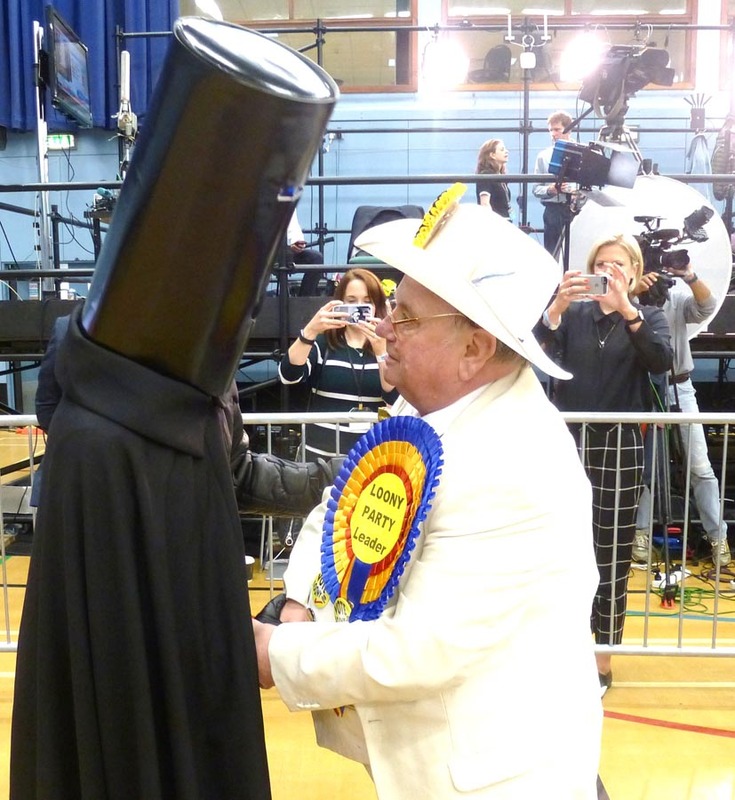 Despite this, it will be the 5th general election I’ve lost. 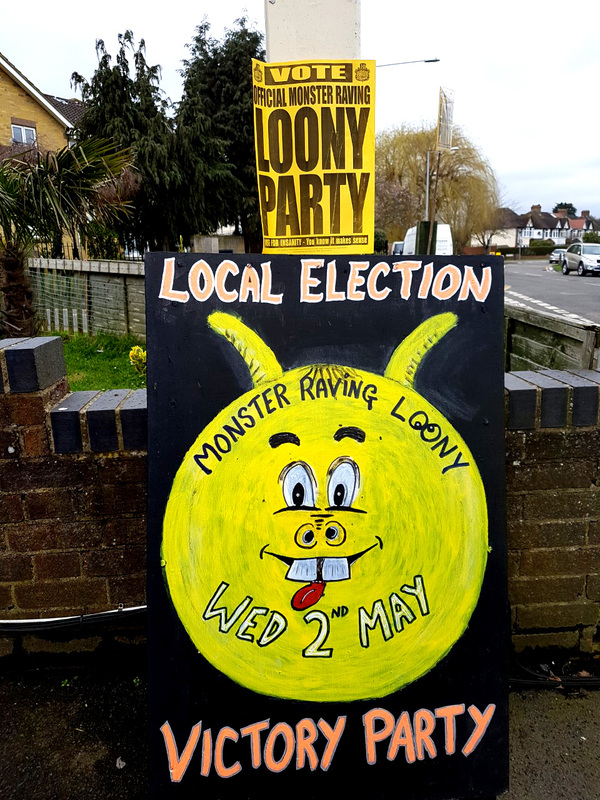 ‘Loony’ policies that we first proposed that are now law include reducing the voting age from 21 to 18, allowing independent local radio stations, passports for pets, and all day opening for pubs. We were the first to advocate lowering the voting age to 16. ‘Green policies’. Roofs of all new housing to be made of solar panels. Giant ‘hamster wheels’ to be placed in all public parks for joggers to run in. These will generate free electricity for pensioners. ‘Brexit policies’. Place a row of toll booths across the English channel to charge for European access. France to give us back Brittany. Europeans who drive on the wrong, right hand side of the road to drive on the right, left hand side. 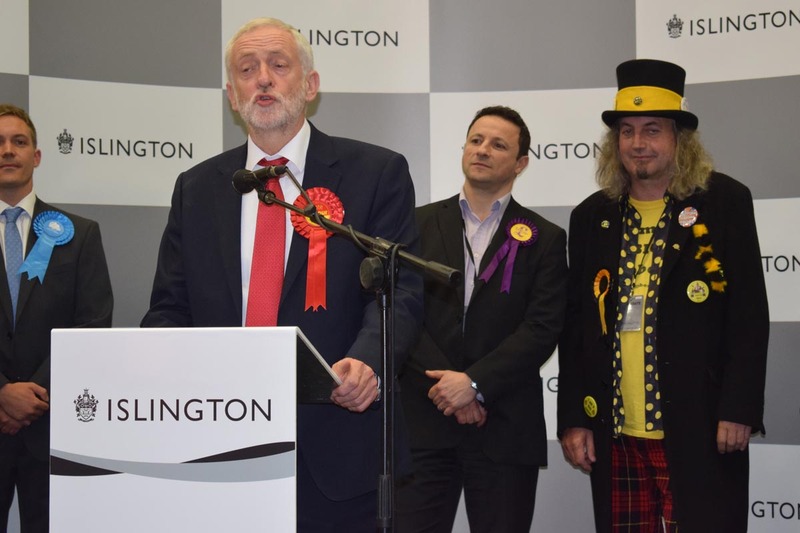 We think Labour have missed a trick with their return to the 70’s. I remember the 70’s had nationalisation ruining industry, pointless strikes, and the 3 day week. The 60’s is a much better option – good music, long hair, peace and love! Most importantly, we are the only party that promises to SAVE THE DODO.